Dr Aron Mazel is responsible for the overall running of the project, including the conceptualisation of the metadata and specification of the panel database and website; data collection and entry; scanning and processing of drawings; slides and negatives; all aspects of the fieldwork programme; the drafting of the text for Interactive Zone; and the project outreach programme. Member of the Project Management Team. • The management and interpretation of cultural heritage. • History of South African museums. • The construction of hunter-gatherer archaeological history, including the integration of information derived from excavations with that from rock art (research area: Thukela basin, South Africa). • The absolute and relative dating of rock art. • The portrayal of San hunter-gatherer and Black farming community archaeological history in South African schools textbooks and museums since the 1970's. • Changing interpretations of hunter-gatherer history. 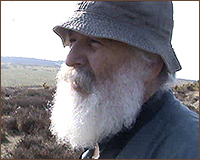 Following a long career in research and museum management in South Africa, Aron Mazel moved to Newcastle University in the middle of 2002 to lead the 'Northumberland Rock Art: Web Access to the Beckensall Archive' project (rockart.ncl.ac.uk). After the completion of this project, he took up a lecturing position at ICCHS in January 2005. 2002 Head: Research & Interpretation (Social History), Iziko Museums of Cape Town. 1998 - 2002 Director, South African Cultural History Museum. 1994 - 1997 Assistant Director, Natal Museum. 1981 - 1994 Museum Human Scientist (Archaeology), Natal Museum. 1979 - 1981 Temporary Professional Officer (Archaeology), Natal Museum. 1978 Tutor (Archaeology), University of Cape Town. Association of Southern African Professional Archaeologists (ASAPA). British Rock Art Group (BRAG). Council for British Archaeology (CBA). Museums and Galleries History Group (MGHG). Pan African Association for Prehistory and Related Studies. The Society of Antiquaries of Newcastle upon Tyne.